Producing the entire media suite for this awesome San Antonio-based company. Feature video, feature written word, imagery for Mercury’s salt and freshwater programs. Extremely excited to be Bridgford’s media provider! One of the most stacked team of pros in the world, we’re glad to work with Humminbird. New for 2018, proud to help communicate the Molix brand. On the cutting edge of fishing technology. Written and photographic content for this Outdoor Channel production..
It’s an extreme honor and pleasure to work with these fine companies in 2018. Oakely Howell wonders “How did that fish not eat my dad?” as Livingston pro Randy Howell bags up a giant on Day 3. Photo by Joel Shangle. Gene Larew pro Tommy Biffle loaded up a behemoth on Day 2. Photo by Joel Shangle. King Leonidas returned to Sparta. Rather, Daiwa pro Seth Feider returned to Mille Lacs. With 26-2. Photo by Joel Shangle. Tackle Warehouse pro Jared Lintner tucked behind two Mille Lacs tubs. Photo by Joel Shangle. Simms pro James Elam averaged 4.5 pounds a smallmouth … and finished fifth! Photo by Joel Shangle. Livingston pro Hank Cherry, just another toad. Photo by Joel Shangle. Megabass pro Chris Zaldain wrestled 26-1 of Mille Lacs smallies into his Day 2 bag. Photo by Joel Shangle. Bass Mafia pro Greg Hackney piled up a personal-best 23-5 on Day 1. Quicksilver Marine pro Jacob Powroznik loads up 23-4 on Day 2. Photo by Joel Shangle. If it seems like we’ve known Bradley Roy since he was a child, that’s because it’s mostly true: Roy started fishing the Opens when he was 18, and became the youngest Elite qualifier in history shortly thereafter. Now at the ripe old age of 27, Roy is the man to beat. Photo by Joel Shangle. Brent Chapman finds himself in the thick of the AOY race for the first time since he won that award in 2012, and he can thank an off-season adjustment for this year’s success: “I simplified everything I do. It’s really made a difference in my day-to-day success.” BASS photo by Seigo Saito. I think we can all stop feeling sorry for Casey Ashley when he complains (good-naturedly) about his dislike of smallmouth. Ashley is fresh off a second-place finish on Lake Oahe, and he finished in the Top 10 the last time the Elites fished the St. Lawrence River in 2017. That said, watch out for Ashley if he heads into the AOY Championship on Lake Chatuge within 15 points of the lead, he’ll be right at home in that Blue Ridge Mountains fishery. Photo by Joel Shangle. Josh Bertrand has been the most consistent Elite pro in 2018: he’s finished in the Top 50 at every event, with two Top 10s. Expect Bertrand to make a surge inside the Top 6 at the St. Lawrence event: he’s finished 8th, 11th and 16th the three times the Elites have fished there. Photo by Joel Shangle. Justin Lucas will be the first to admit that he entered the 2018 season with a chip on his shoulder after a dramatically sub-par season in 2017. Mission accomplished: Lucas is the hottest angler on the roster heading into the Chesapeake Bay event, notching three Top 12s in a row. Photo by Joel Shangle. The quietest AOY race: who will claim the 2018 Bassmaster Elite Series crown? Yamamoto pro Larry Nixon bagged up another Top 10 finish at the FLW Tour event on the Mississippi River. Photo by Joel Shangle. 1. They call Livingston pro Andy Morgan “The GOAT” for a reason. This is the last guy I ever want to fish against, and the first guy’s house I’m going to in a zombie apocalypse. Photo by Joel Shangle. 2. YUM pro Jason Christie is also my starting shooting guard in any game of pickup 3-on-3. Photo by Joel Shangle. 3. Does it seem like BPS pro Ott Defoe has been around forever?!? Well, he hasn’t. He’s just been so damned good in the six years he’s fished the Elite Series that it just seems like it: Top 20 50% of his tournaments! Photo by Joel Shangle. 4. 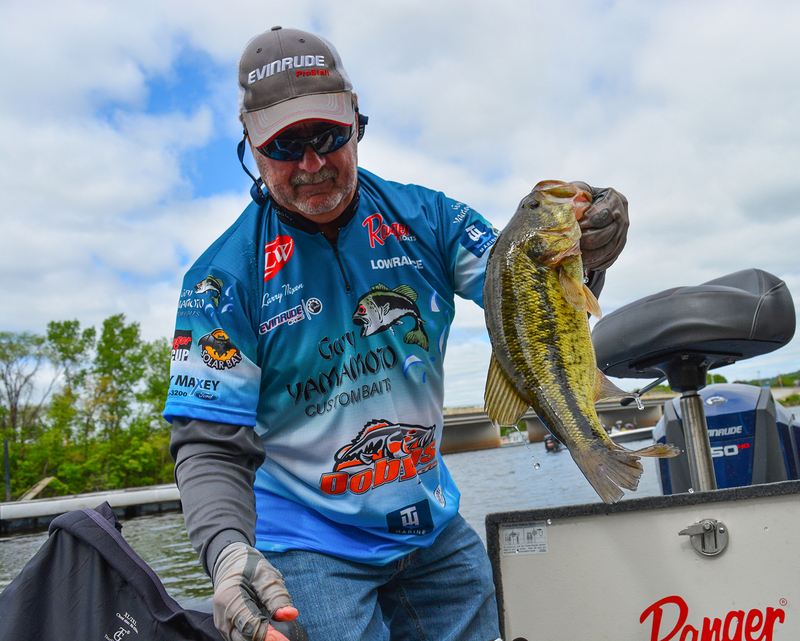 Talk to Fitzgerald Rods pro Bryan Thrift before a tournament and you’ll swear he won’t catch a single fish. And then he’ll beat you 99 days out of 100. Photo by Joel Shangle. 5. I can tell that the rest of the Elite Series field is nervous that Rigid pro Brandon Palaniuk has matured into a consistent Top 10 guy. He’s always had the ability to win tournaments, but now you throw in AOY-level consistency? Yeah, no thanks, I don’t want any part of a head-to-head with BP. Photo by Joel Shangle. 6. Is Enigma pro Aaron Martens having a down year? Well, yes, especially by his standards. But out of this list of nine, I’ll wager that Aaron is the guy THEY would least like to have to beat head-to-head. Photo by Joel Shangle. 7. Nicest guy you’ll ever meet, ol’ Ark Rods pro Randall Tharp … and then mention the word “compete” or “contest” or “game” and the Honey Badger comes out. The only way I’m ever facing off against Tharp is if it’s a drop-shot-only contest on Lake Washington, and Tharp is blindfolded. Photo by Joel Shangle. 8. You know when somebody just HAS it?!? You can’t even identify it, but you can tell that whatever IT is, they have it, and you don’t. Carhartt pro Jordan Lee owns “IT”. This guy is going to be a terror for the Elite Field for years to come. Photo by Joel Shangle. 9. Unless you’ve been on a boat with Quantum pro Kevin Vandam, you can’t begin to understand just what a machine he is. Not in a robotic way, but in an “I’m going to beat the daylights out of you” way. Photo by Joel Shangle. 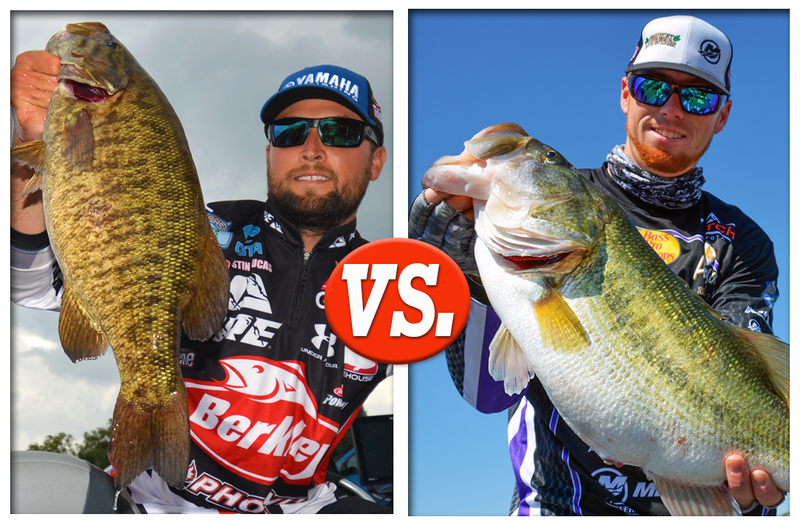 The Nomad 9: Who would we least like to face in a head-to-head fish off?